It's slightly unnerving to find yourself on a rugby pitch with a six foot male player running at full pelt towards you, especially when you're a 5'3" rugby novice. 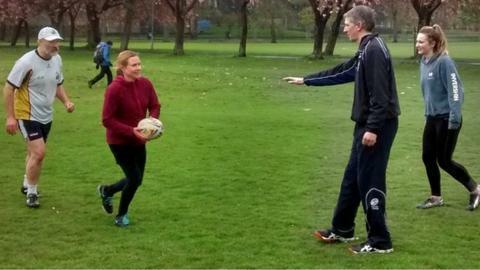 However, the beauty of Touch Rugby is that it's minimal contact. In other words, you don't get tackled. There are also no scrums or kicking. Also, unusually, men and women of all ages and abilities can play together. All you need to be able to do, I'm told, is to run. "Being able to catch and pass a ball helps, but it's not mandatory," says Peter Faassen de Heer of Scottish Touch. That's lucky because, prior to this, I don't think I have ever thrown or caught a rugby ball. "The game came from Rugby League originally," says Peter. "In Rugby League you have six tackles. Here we have six touches before the ball changes hands to the other side." I'm soon being put through my paces and I'm told to pass the ball backwards to my team mates, while running towards the try line. The other team attempts to touch the player who is in possession of the ball. I'm told the aim is to score a try before your team has been touched by the opposition six times. Any words of wisdom, gleaned from Peter during my practise session, vanish as soon as I pluck up the courage to join in a proper game. I spend about 10 minutes running forwards and backwards (mostly backwards). I manage to catch, throw and drop the ball a few times, after it is thrown charitably in my direction. However, I forget to keep an eye on my opponent, who has been sitting quietly on the wing, before she gracefully catches the ball and glides past me to score a try. I use the moment, to slope off and catch my breath with the others who are watching the game on the sidelines. Jackson Thirgood, who previously played Rugby Union, says he enjoys playing a mixed game. "The girls are actually some of the best people on the pitch," he says. Iona Smith says: "It's quite daunting at the start because all the boys have played rugby and seem to know what they are doing. "But once you get the hang of it, it's really good fun." Iona, and her friend Megan McLaren, have been coming for a year and were recently selected to play for the under 18s Scotland team. Megan says: "I had no idea what I was doing at the start, but you learn quite quickly. "I wouldn't have expected to play it as much or to have enjoyed it as much as I did." Two weeks shy of 60, Dunkan Armstong is the oldest on the pitch. "It's completely inclusive," he says. "Whatever age you are, whether you're male or female, you can play at any level. "You can play for fun like we do here, or in a league, or internationally. "You can come out enjoy being active in the great Scottish weather. As I look around me on a wet Edinburgh afternoon in the Meadows, with the blossom trees in their full glory, and bits of grass stuck to my face, I decide he might just be right. If you want to find out more about getting more physically active, take a look at the BBC Get Inspired website.